Part of the beautiful madness of The Internet is that the things otherwise-harmless folks none the less afflicted with with severe mental illnesses might have in previous years kept locked in their own heads or scrawled on the basement walls now get made into searchable websites. Digging around for gems in that vein is a perverse hobby of mine, and today I found the rare one worth sharing… and yes, I looked into it – apparently this is NOT a joke. Former New York Gov. David Patterson and Moammar Ghaddafi? SAME PERSON! Jay Rockerfeller is actually CHEVY CHASE! ONE mysterious woman is Michelle Bachmann, Laura Ingraham AND Caroline Kennedy. Robert Blake was also POPE BENEDICT. No direct link for this one, but he makes an especially tasteless leap alleging that Holly Robinson Bush – George W. Bush’s sister who died in infancy from leukemia – is in fact alive and walking among us as… HILLARY CLINTON. Also un-linkable: Ron Paul is SIR IAN MCKELLAN. Not only was Gabby Giffords NOT actually shot in the head, she’s really just TINA FEY… who is in turn really just Jennifer Greenberg Sexton – a member of a wealthy family he is deeply obsessed with. 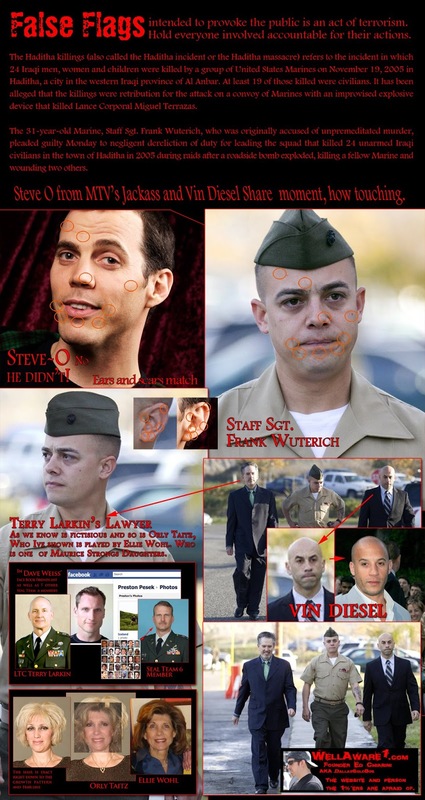 And, of course, Steve-O and Vin Diesel participated in faking The Haditha Massacre.